Bombay Bicycle Club are back with their fourth album in five years. 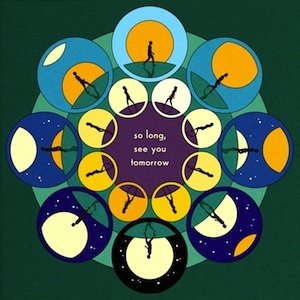 But So Long, See You Tomorrow isn’t just another great album churned out by our UK favs. It’s an album that effortlessly combines the band’s familiar indie rock riffs with experimental electronic. To be honest, it sounds like they’ve been listening to a lot of Washed Out and taking queues from the shimmering synths found on Paracosm. Additionally, BBC, all still well in their early twenties, are also certain to have been influenced by frontman Jack Steadman’s travels to India, Turkey, Europe, and Tokyo. (Check out the track “Feel” and while you’re at it, prepare yourself to dance). The final and title track is much like an epilogue to the album, starting off down tempo in the opening minutes but finishing the six minute song full throttle, repeating “keep goin’ round and round and round.” A quick glimpse at the album art might not immediately reveal much, but once you learn that the entire album is on one continuous loop, you start to notice a common cyclical thread. If you’re on BBC’s home turf, look for tour dates in February and March. For dates in the States, mark your calendars for April.